LOLER (Lifting Operations and Lifting Equipment Regulations) testing or proof load testing - This involves the periodic testing, normally to one-and-a-half times the lifting equipment's rated, safe working load, by test weights, strain or load gauges, this includes all types of lifts and hoists. Material Testing or destructive testing - what force or weight does it take to tear material, break a cord or snap a widget? The above tests are normally used to satisfy Health and Safety requirements or quality control requirements so these weights are normally purchased with one of our certification options to demonstrate their accuracy. Weights used for proof load and quality tests do not need to be as accurate as calibration weights used to test weighing equipment. You can choose iron bar weights calibrated to the M1 standard as used for testing scales if you prefer, but we also offer them as Proof Load Weights with an accuracy of +/- 0.1%. Reducing the accuracy makes the weights less expensive because less time is required to adjust them, and because the tolerance is larger the weights are less likely to drift outside the specified tolerance when using in the more demanding conditions of proof load testing. Test weights come in all different shapes and sizes depending on what they are made of, how heavy they are and how they are used. 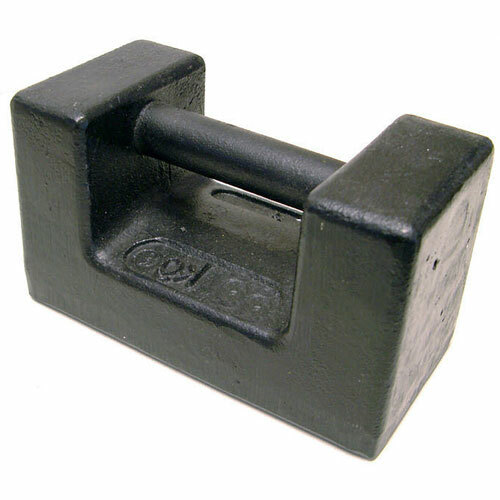 Cast iron proof load bar weights are ideal for proof load testing requirements where the weights need to be carried but they can also be moved on pallets or in cages so they make a flexible choice for proof load testing. 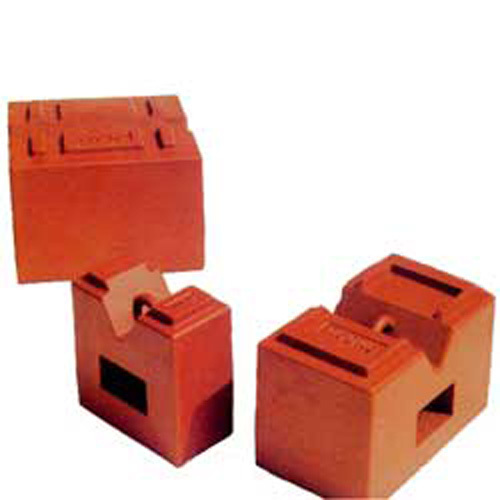 These weights are supplied with an accuracy of +/- 0.1% and are normally purchased with one of the certificate options available as detailed below. 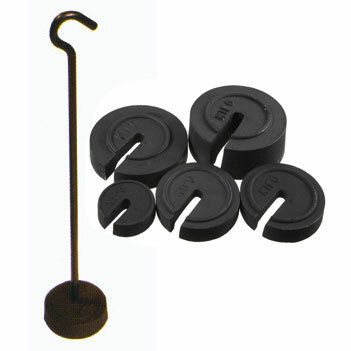 These weights are available in 5 kg, 10 kg or 20 kg to suit your requirements. Our iron hanger & slotted test weights are an ideal choice for many load test applications because the hanger with its integrated hook allows these weights to be attached to a large variety of rigs, materials and lifting equipment. The hanger is a weight in itself and is what will hold the rest of the weights. The slotted weights are discs with slots in them that sit on the hanger. The number and size of slotted weights that will fit in the hanger can be varied, allowing tests from 500g to 200 kg depending on the weights purchased. Slotted weights and hangers can also be ordered with a Newton value for force measurements. Our brass hanger & slotted test weights are an ideal choice for many light load, test applications because the hanger with its integrated hook allows these weights to be attached to a large variety of rigs, equipment and materials. The hanger is a weight in itself and is what will hold the rest of the weights. The slotted weights are discs with slots in them that sit on the hanger. The number and size of slotted weights that will fit in the hanger can be varied, allowing tests from 10g to 1000g depending on the weights purchased. 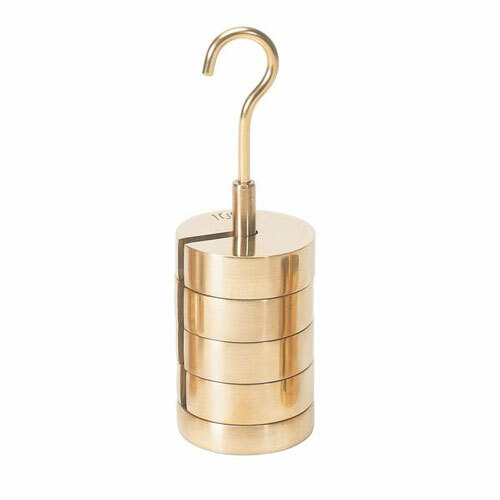 Brass slotted weights and hangers can also be ordered with a Newton value for force measurements. 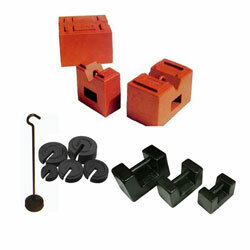 Cast Iron Block Weights weights are used for high capacity proof load testing applications. The weights come in two different designs, one design as per the picture includes a fork guide and a loop in the top so they can be lifted by a fork lift truck or a hoist/crane and the other design can be moved with pallet truck scales or a crane/hoist. The second design can also be used with a fork lift truck but because the first design uses a closed fork guide this is the one we recommend for fork lift trucks because it is a safer load. Tests are normally used to satisfy Health and Safety requirements or quality control requirements so weights are normally purchased with one of our certification options to demonstrate their accuracy. This is the same as above except for an extra charge the weights are given identification numbers (these can be chosen by yourself or we can assign them). Each weight is then identified on the certificate with its exact reading, so you can see how much inside the tolerance limits it is. This guide should give you enough information to steer you in the right direction but if you do require any further assistance please give us a call on 01842 751633 or send an email to quotations@blakeandboughton.co.uk as we are more than happy to help.